Officers of Scotland's Strathclyde Police Department will be patrolling the streets in style thanks to an impounded Audi ABT AS7 TDI S-Line converted from gangster-ride to police patrol car. 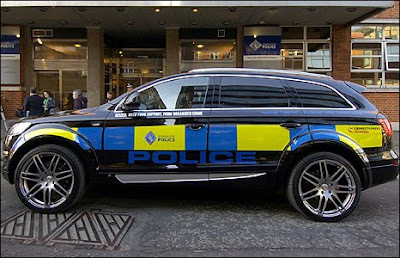 The Q7 SUV tuned by ABT Sportsline now carries full police livery and will be part of the Strathclyde's Gang Task Force. The AS7 TDI boasts 300 hp and 450 lb/ft of torque and this particular vehicle had previously belonged to a criminal gang in Glasgow. This marks the first time that the Strathclyde Police will be using an impounded vehicle as part of their fleet. Assistant Chief Constable John Neilson said "The hard working, law abiding citizens need to know that we are hurting those involved in serious and organized crime where it matters - their pockets."